LAWTON, Okla. — After nearly four decades working in power generation, Dean Ellis, manager of Comanche Power Station, will soon be retiring, announced Gary Knight, vice president – Generation for Public Service Company of Oklahoma (PSO). Ellis will be succeeded as plant manager by Erik Scott, currently an operator at Comanche. 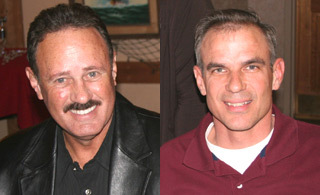 Dean Ellis (left), will retire at the end of September as manager of Comanche Power Station after 39 years of service. Erik Scott (right), has been named to succeed him as manager of Comanche on Oct. 1. Ellis, who has been the plant manager at Comanche Station since October 2006, says he is fortunate to have worked with good people in many parts of the AEP footprint, from west Texas to Kentucky to Oklahoma. Scott will officially take over the reins at Comanche on October 1, 2012. Scott has been a plant operator at the plant for the past six years. Prior to joining AEP, he spent more than 22 years in the U.S. Navy serving in multiple capacities, including master chief, assistant operations superintendent, maintenance superintendent, and operations & maintenance supervisor managing nuclear power plant operations on submarines. Located in Lawton, Comanche Power Station is a natural gas-fueled power plant with a total generating capability of 235 megawatts. Congratulations to Dean on a long, successful career. Enjoy your retirement. I have enjoyed mine. I know Erik will do a great job and carry on the Comanche tradition of hard work and resilience. Congratulations Dean. We only worked a few times together, but I know you will be missed. Retirement isn’t what you expect…It’s BETTER.